A holiday with your pet is always special. Nobody wants to leave his beloved pooch at home and especially the kids love it when the pet accompanies you on your holiday. You can bring your dog along for long walks and day trips, but you can take your cat, rodents and birds with you as well on holiday. It starts with a place to lay your heads down and not having to worry about a family member out in the rain or being left behind at home. After all, a holiday is only complete with everyone present, including your beloved pet. Explore new territories together and spend a wonderful time in our spacious pet-friendly accommodations across the most beautiful countries of Europe. We have accommodations at your disposal in some of the most beloved regions by pet owners: across the entirety of the Netherlands, including, most notably, in Zeeland, the North Sea Coast and North Holland. Germany, and its regions such as Eifel-Moselle, Sauerland and Black Forest provide beautiful sceneries for walks with your pet(s). Or hiking, cycling, exploring traditional villages and cooling off in beautiful rivers and streams in summer is also an option for the adventurous. Even if you have France, Belgium, Italy or Spain in your sights, you’ll find we have the most desirable regions packed full of accommodations for you and your pet(s). Bring your dog along for long walks among nature, for day trips, for a weekend away, a summer holiday at the beach, one in the mountains or a family reunion. The possibilities are endless among the more than 26.000 pet-friendly accommodations we have to offer. 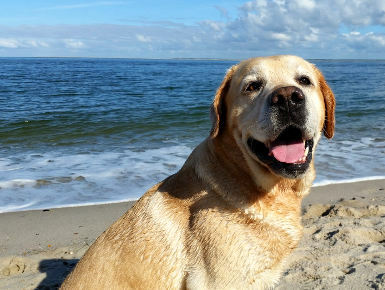 Take your dog with you to the beach and enjoy the waves together with the entire family! Play around with a beach ball or a frisbee and make every moment special. Take long walks, enjoy the sunset, relax at a beach terrace and taste the local specialties in France, Italy or Spain. Or check out Noordwijk for example, on the Netherland’s North Sea coast. It is said to be the most beautiful dog-beach in Europe and it offers an enchanting mix of sand, dunes and dog-friendly cafes and restaurants. It is surrounded by bulb fields and, during blooming season it is a real marvel. Another great option is Crikvenica in Croatia, where you can even buy ice-cream for your pooch and a special non-alcoholic beer for dogs called “Snuffle”. Cracking open a cold one with the “Good Boy”. Is a better bonding experience even possible? 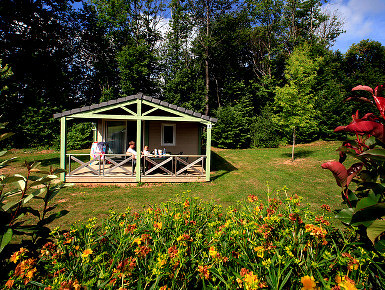 Should you choose the holiday park La Sapiniere in Luxembourg for example, you’ll find it’s bordered by a large nature reserve which has several wonderful hiking routes. Many rivers and brooks flow through this region. 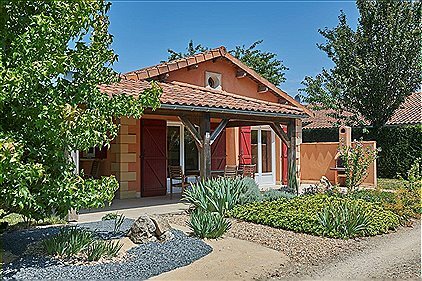 It’s full of forests, fields, vineyard-covered mountains and breathtaking landscapes. 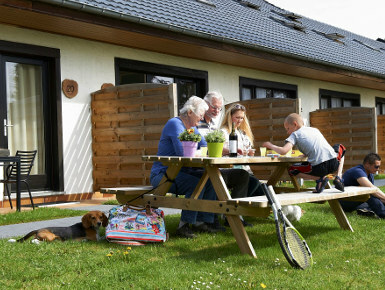 Ferienpark Grafschaft Bentheim in Germany is yet another great option, offering endless opportunities for relaxation in a beautiful rolling countryside where forests, heathland, meadows and fields alternate. You can spend the evenings barbecuing and the mornings with breakfast on the terrace, with nature all around you to explore it all day with your best friend. Our pet-friendly holiday parks are safe and offer plenty of space for your tail-wagger to run around without you having to worry that he or she will get lost. Many of our holiday villas have enclosed gardens, vast estates and even allow more than one dog. A much easier and much more comfortable vacation with your dog in a holiday home than in a cramped hotel. You have more space, you have more comfort and you don't have to worry that your pooch doesn’t get enough exercise or space to have fun. Definitely plan ahead when thinking of a vacation with your pet, so book a house that is perfectly suitable to your needs. Most of our accommodations have a great location and offer various possibilities to walk around and explore the surroundings. Make sure your pet has all the necessary documents for traveling and get ready to start your new adventure with Bungalow.Net!